The polling in Iowa and New Hampshire was volatile, but it generally reached something of a consensus in the day or two before the elections there. 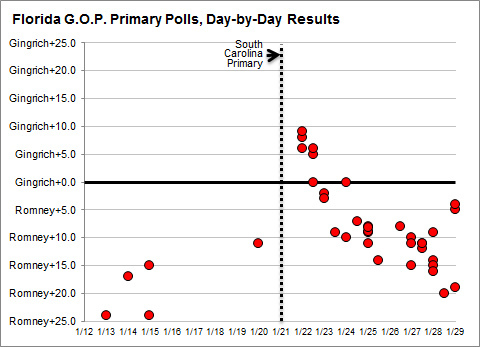 There was somewhat more diversity in the South Carolina polls, but some of that was because Newt Gingrich’s surge there was very rapid, meaning that the exact timing of the poll made a fair amount of difference. In Florida, by contrast, we are seeing quite a wide diversity of results, even among polls that were in the field at the exact same time. A Suffolk poll, for instance, conducted Saturday and Sunday, gives Mitt Romney a 20-point advantage in Florida. And an automated poll from the firm We Ask America, conducted on Sunday night, put Mr. Romney 19 points ahead. At the other end of the spectrum is a poll from InsiderAdvantage, which was also conducted on Sunday. 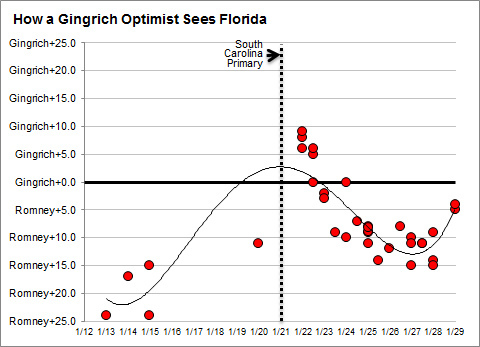 InsiderAdvantage has generally shown favorable results for Mr. Gingrich, and it does again in this case, showing a tightening in the race and having him behind by just 5 points. Meanwhile, a Public Policy Polling survey, conducted Saturday and Sunday, has Mr. Gingrich with a manageable-looking 7 points deficit. And he was down just 4 points in interviews conducted on Sunday alone, according to a cross-tabulation provided to FiveThirtyEight. I’m not sure that all that much will be accomplished by trying to dissect the reasons for the differences. There are stronger and weaker pollsters on either side of the ledger, and those using different methodologies. Our forecast model does include some “fancy” features. It weights the polls based on their sample size as well as their past accuracy, uses a method to allocate out undecided voters, attempts to account for a candidate’s momentum, and so on. It is also the case, according to our research, that the greater the variability in the polling, the greater the potential error in the polls, even when they are averaged together. If you have six polls that all show a candidate exactly 10 points ahead, that is not quite the same as having three polls showing him with a 20-point lead and three others showing the race tied. Although the average is the same, there is more uncertainty in the outcome in the second case, meaning that the trailing candidate has somewhat better odds of pulling off an upset. Neither of those outcomes are impossible — if Mr. Gingrich has some slim chance of winning, there’s also the chance that he could lose by 25 or more points. But they’re not where the balance of the evidence lies. Odds are, instead, that Mr. Romney will win by somewhere in the range of 10 points to 20 points, meaning that many networks are likely to declare him the winner shortly after polls close.